After being called out for hiding worker injuries at its factory, Tesla decides to double down. 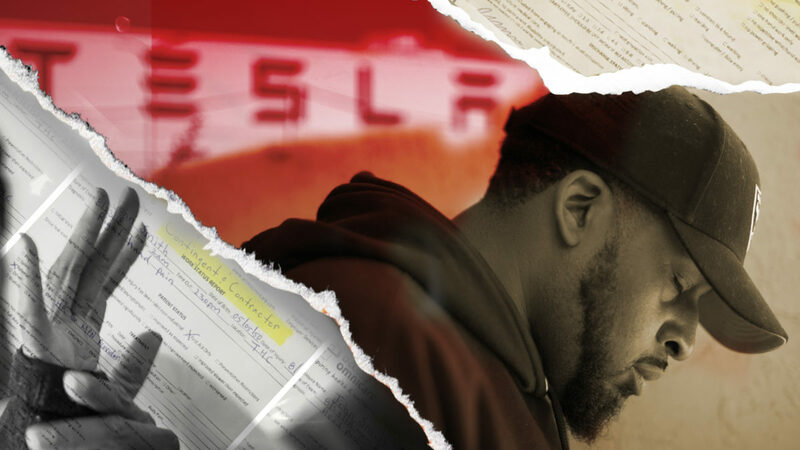 As Tesla races to revolutionize the automobile industry and build a more sustainable future, it has left its factory workers in the past, still painfully vulnerable to the dangers of manufacturing. It’s a story we’ve been covering closely. Last week, we published our newest investigation into the working conditions at CEO Elon Musk’s factory. Even as Tesla pushed back against our previous reporting, it doubled down on its efforts to hide injuries from the government and public. The Tesla factory’s medical clinic has failed to properly care for injured workers as part of a strategy to lower the company’s injury count. By calling work injuries non-occupational, denying medical treatment to those who need it and sending seriously injured workers back to the production line with no work modifications, Tesla avoided counting those injuries and made its safety record look better than it actually is. Tesla’s contract doctors tell staff to send injured workers to the emergency room in a Lyft instead of an ambulance. The Guardian reported that Tesla workers endured long hours, injuries and intense pressure to meet Musk’s production goals – and cited 911 calls for fainting spells, dizziness, seizures, abnormal breathing and chest pains. Also, the advocacy organization Worksafe issued a report that Tesla’s injury rate was higher than the auto industry average. The reports came as the United Auto Workers tried to unionize the plant. In February 2018, BuzzFeed reported that the tremendous production pressure resulted in lifelong injuries, including repetitive stress injuries from not rotating positions. We reported that Tesla was undercounting injuries – failing to record them on legally mandated logs that determine the company’s injury rate. Overall, we found that Tesla prioritized speed over safety and ignored the concerns of its own safety professionals. Members of the safety team were told not to use yellow, the standard safety color, to mark certain factory hazards because Musk didn’t like the color. Tesla called us an “extremist organization” in a statement before the story was published. California’s workplace safety agency opened an investigation – more on that below. At Tesla’s annual meeting, Musk said the company’s injury rate was going down and Tesla had a chance at being half the industry average. “I really care about this issue,” he said. The same month, Tesla hired Access Omnicare to take over its on-site health clinic. Also in June, a former high-level Tesla safety official sued the company for allegedly firing him in retaliation for reporting unsafe conditions and illegal practices. Cal/OSHA, California’s workplace safety agency, wrapped up its probe of Tesla, fining it $400 for failing to record a single injury in the required timeframe. Tesla has used this to claim it was cleared of wrongdoing. But the agency told us it found several other examples of undercounting injuries that were outside the six-month statute of limitations – and that even if it could cite Tesla for them, the total fine still would be $400. Following our reporting, Gov. Jerry Brown signed a law to extend the period regulators have to fine employers for undercounting injuries. It is now six months from when investigators discover the violation instead of six months from the date of the injury. That brings us to our latest investigation, which found that Tesla doubled down on its efforts to hide serious injuries from the government and public. As for Cal/OSHA, the agency wasn’t interested when a Tesla clinic whistleblower came forward. After she insisted and we started asking questions, the agency said it would investigate. Tesla, meanwhile, distributed a statement from the clinic doctor criticizing the story. Even as Tesla pushed back against our previous reporting, it doubled down on its efforts to hide injuries from the government and public. The Tesla factory’s medical clinic has failed to properly care for injured workers as part of a strategy to lower the company’s injury count. By calling work injuries non-occupational, denying medical treatment to those who need it and sending seriously injured workers back to the production line with no work modifications, Tesla avoided counting those injuries and made its safety record look better than it actually is. Tesla’s contract doctors tell staff to send injured workers to the emergency room in a Lyft instead of an ambulance.